Okay, so this one was OUT OF THE BALLPARK good. I know I say that often when I talk about One Local Summer meals, but seriously. I’m not sure there is too much that will top this. We finally found a local source for butter and husband immediately remembered that the only thing holding us back from making these pretzel rolls was the butter. BINGO! 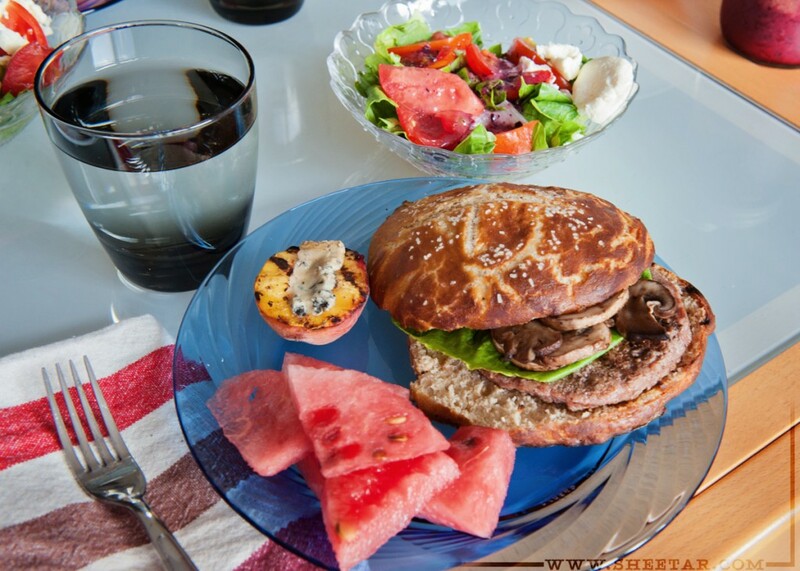 Thus, dinner was Pretzel roll burgers with watermelon, grilled peaches with blue cheese, and a wonderfully delicious salad. Even though there are some non-local ingredients in the rolls (baking soda, yeast, oil), they’re still really minimal in comparison to the whole of the meal, and we were even able to substitute the required sugar with honey. Our rolls came out a little flatter than the recipe’s photos, and I had a feeling we should’ve used more flour (the dough seemed a little too squishy), but for a first time, they’re still 100% edible and delicious. I was really glad we had leftovers of this meal so I could enjoy it a few more days, and we even have four more rolls tucked away in the freezer. Definitely expect to see more pretzel rolls in our One Local Future! Non Local – Baking soda, yeast, oil, salt, pepper, dressing.